Many believers have a difficult time evangelizing because they make it far more complicated than Jesus intended it to be. This book presents practical, easily understood ideas that can enhance one's witness and make evangelism easier. Author Larry Moyer, founder of the well-known evangelization organization EvanTell, shares knowledge he has learned over his forty-plus years of sharing the gospel, and presents all of it in this handy book. Those who have been sharing the gospel for years will wish they had read this sooner, and those who are new to evangelism will be glad they're reading it now. 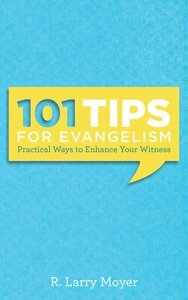 About "101 Tips For Evangelism"
R. Larry Moyer (Th.M., Dallas Theological Seminary) is president and CEO of EvanTell, Inc., an evangelistic association in Dallas, Texas, and is a speaker at evangelistic outreaches, training seminars, and in classrooms across the country. His other books include Free and Clear, Larry Moyer's How-To Book on Personal Evangelism, Thirty-One Days with the Master Fisherman, and Welcome to the Family (by Evantell).